01. The bearers of bad tidings sometimes do so with a slight grin, knowing well the nature of their predicament. So too do Leeside “forgotten folk” trio Morning Veils. 02. 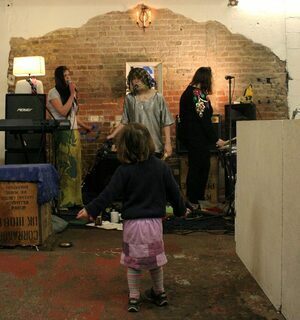 Emerging a few years back as an aside to its members’ main preoccupations, the trio is comprised of Elaine Howley (The Altered Hours/Crevice), Roslyn Steer (solo/Crevice/KantCope label/ex-Saint Yorda) and Aisling O’Riordan (Quarter Block Party festival). 03. Streaming above is the newly-released video for single Elusive Fruit, created, produced and directed by local performance artist Eilis Collins. 04. It’s taken from the band’s debut release, Her Kind, available for streaming and download from KantCope’s Bandcamp page. Cassette copies long sold out by now, of course. Thoughts: Rarely seen in the wild, but always worth observing, Morning Veils’ reverby, shoegaze-leaning folk is a joy. Posted in Music, You May Like This and tagged Cork, folk, Ireland, Morning Veils, new Irish music, new music at 9:50 am on May 9, 2017 by Broadsheet.